A Royal Jordanian plane at the airport in Aqaba. Photograph taken by Berthold Werner distributed under a CC BY 3.0 license. The King Hussein International Airport (AQJ) is about to get a lot busier! Until now, the Aqaba Airport’s only regular flights have been limited to other places in Jordan and the Middle East. Starting at the end of October and beginning of November 2018, three budget European airlines will begin flying directly to Jordan’s gateway to the Red Sea. Ryanair will begin flying from Athens, Cologne/Bonn, Rome-Ciampino, and Sofia. Norwegian Air Shuttle will being flying from Copenhagen, and easyJet will begin flying from Berlin–Schönefeld and London Gatwick. Arriving in Aqaba will make it very easy for guests to visit Wadi Rum and Petra, two of the region’s top tourist attractions. However, Aqaba is a city with about 150,000 people and a history that dates back to 4000 BC, so there are definitely some fun and interesting things to do in Jordan’s only coastal city. Aqaba Marine Park. Photograph by Red Sea Explorer. Most people don’t think of Jordan as a destination for swimming, diving, or relaxing on the beach. There’s a good reason for that; Jordan’s coastline is only about 20 km (~12.5 miles) long. However, what it lacks in length, it more than makes up in quality. The coastline south of Aqaba is known for being an exceptional location for scuba diving and snorkeling due to its clear waters and interesting wildlife. Scuba Diving in Aqaba. Photo taken by Benjamin Izbicki, @iz.benja on Instagram. Aqaba’s top diving spots are all located along the coastline between the city center and the Durra Border Crossing with Saudi Arabia. The main diving area is known as the Aqaba Marine Park. The Aqaba Marine Park is the Jordanian part of the larger international Red Sea Peace Marine Peace Park, established in 1997 to protect the underwater environment in the Gulf of Aqaba. Fishing is not permitted and boat traffic is heavily restricted. Hopefully, this will keep these waters full of wildlife for generations to come! Entering the water from the beach, you will cross areas of sandy sea bed and seagrass before arriving at the reef which starts about 20m from the beach and extends about 100m into the Gulf of Aqaba. It is also possible to enter the water by using one of the jetties so that you don’t disturb the environment between the beach and the coral reef. The Red Sea is known for known for its clear waters. The visibility is fantastic due to the sheltered nature of the sea itself. While under the water, you may spot the Red Sea clownfish, lionfish, green sea turtle, and the Eritrean butterflyfish, among many others. Another great aspect of diving in Aqaba is that it can be done comfortably year round. Although it might get a bit chilly on land in the winter, the waters remain a nice comfortable temperature for the entire year. On land, there is a wide selection of hotels, resorts, and diving clubs waiting to help organize your Red Sea diving experience. Whether you are experienced or have never gone scuba diving before, these establishments are experienced and ready to provide you with everything you need to give you a memorable Jordanian diving experience. If you want to just enjoy the sun instead of going diving, you can check out the Aqaba Aquarium located nearby to see and learn about the local aquatic life. Juglet with beads at the Aqaba Archaeological Museum. Photograph by Ana al’ain, distributed under a CC BY-SA 3.0 license. Aqaba has a long history. Archaeological digs have suggested that Aqaba has been inhabited by humans since around 4000 BC and at the time was a center of copper production. In 1500 BC, the first port in Aqaba was built and it became an important location for trade between Africa and Asia. Since then, Aqaba has been conquered by the Assyrians, Babylonians, Persians, Greeks, Nabataens, and many more. The best place to learn about the history of Aqaba is to visit the Aqaba Archaeological Museum. Aqaba Castle - photograph by Mervat Salman, distributed under a CC BY-SA 4.0 license. 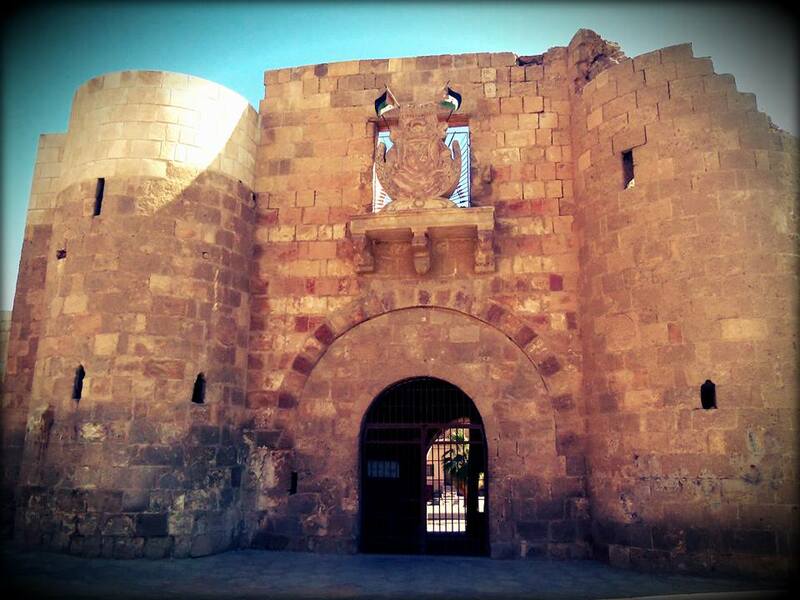 The Aqaba Castle (also known as the Aqaba Fort or Mamluk Castle. Is located just south of the Aqaba Museum. This castle was built by crusaders in the 1100s. Less than a century later, it was recaptured and destroyed by Saladin, a Kurd, and the first Sultan of Egypt and Syria. The fortress was rebuilt in the 1500s by the Mamluks, whose reign ended shortly after by the Ottomans. The castle is an important site in the modern history of Jordan. During the Arab Revolt, which took place during the First World War, the fortress was being heavily defended by the Ottomans. A brave Arab camel charge defeated the Ottomans which led to Lawrence of Arabia immediately riding for Cairo to report the victory. Next to the castle is the world’s sixth tallest flagpole at 130m. The flagpole carries the flag of the Arab Revolt which represents this battle victory. Entrance to the castle costs 3 JD but it is free with the Jordan Pass or a ticket from the Aqaba Archaeological Museum. Some other interesting sites to visit in Aqaba are the 4th century Roman church, considered to be the world’s oldest purpose-built Christian church, and to climb Jabal Um al Nusaylah for a fantastic view over the entire city. A Jordanian mezze. Photograph by Unai Guerra, distributed under a CC BY-SA 2.0 license. As Jordan’s only coastal city, you can find many dishes in Aqaba that you won’t find anywhere else in Jordan. While visiting the city, we recommend you try the sayadeyah (fish, spices, and yellow rice), kishnah (fish, tomatoes, and onions), or bukhari (rice, meat, hummus, beans, ghee, and spices). If looking to try several dishes at once, try a Jordanian mezze. A mezze is a collection of small dishes normally served before a larger meal. In Jordan, you will usually find mezzes which have hummus (chickpea puree), labaneh (strained yoghurt), baba ghanoush (mashed eggplant with spices), olives, pickles, pita bread, and more. You can find lots of restaurants serving affordable food in Aqaba city center. If you are looking for something a little bit less adventurous, tasty shwarma and falafel is not difficult to find. Don’t forget to finish your meal with some delicious baklava for dessert! Have you been to Aqaba recently? Do you have any tips or recommendations for future visitors to Jordan’s only coastal city? Send us a message or let us know in the comments! A view of Aqaba Bay from the Israel National Trail. Photograph by Beny Shlevich, distributed under a CC BY 2.0 license.